So it seems the extended DVD for Battle of Five armies is out. I've been going through the clips that have been uploaded to youtube to see if there's anything decent added to canon. They were mostly underwhelming, unfortunately. Also, no awesome combat scene for Thranduil *sadface*. Didn't bother to look at the extended Legolas vs Bolg scene - the Mario hop over the crumbling stone that made it into the theatrical release already obliterated my SOD for that sequence. WTF is this--? - Helicopter seige...bolts, what? I'm pretty sure that's not possible..really? And...and the dwarven army lugged all of this seige over from the Iron Hills, like, overnight? Over two nights? And then they didn't bother to use them on the orcs/trolls? I'm...not going to accept this as canon. No. Someone's dipped too far into the sauce for fantasy CGI. Ok, this bit here I can accept as canon, if only cuz it kills off that really annoying guy. Thorin's funeral - no Elves or Men in attendance, really? Moar character assassination ho! Where's the frickin' moral of this story?! AAAUGH!! Ok, this one made me laugh. But, uh, why did Thranduil namedrop Ecthelion? The Battle of Five Armies took place in TA 2941, while Ecthelion became Steward of Gondor in TA 2953 (after the death of his father). At this point he's...not even a prince...just the heir to the Steward of Gondor. I mean, would he have cared to know Boromir's name circa LOTR? More White Council vs Nazgul - I can't tell, is the flashing light when Elrond strikes the Nazgul coming from his hand/ring or from his sword? Beorn the bear cavalry - Well at least he looks better than Lupin did in HP. *squints* I wish they actually put him up against one of the giant siege trolls instead of against random canon fodder though. Crushing a bunch of mooks doesn't really do much to establish your cred in fantasy land. We'll gloss over the really obvious one where elves are actually all serial monogamists and metaphysically incapable of having affairs and casual lovers, because if we can't waive that, there's no way to ship these characters. Aside from that, there's a lot of stuff I'm tired of seeing in fics. * Since PJ pushed Gundabad as another major enemy location in the Hobbit films, I shoehorned it in here as well since the xover setting is half-half movieverse vs bookverse as things go. It's also my excuse of where the Sons of Elrond and the Northern Dunedain were in the movie timeline for them to not appear at all in the LOTR movies. * Didn't manage to get screentime with Thranduil in, to my own chagrin. Then again, I wrote so much on his backstory that I guess this is sort of a break. Still working on Part 7 and that will have some more. * So the way I'm meshing together the movie & book timeline is that the Battle of Five Armies in movie canon (and in this xover TL) took place 17 years later than it had in book canon. Coincidentally, the time between Bilbo and then Frodo leaving for Rivendell would also take 17 years less time than it would have in book canon, so that balances out. This way, Aragorn would've been around 27 at the time of BOFA (and hence it would actually make sense for Thranduil to send Legolas off to find a pal who's not a 10 year old boy). But it also means that the ages of the Kings of Dale will need to be pushed back a bit. Bain was 18 at the time of BOFA in the movies, and so here he's still the king instead of his son Brand. Not that I've gotten to showing them yet, of course. That's also in the next part. * Still conflicted on what I'm going to do with Denethor, especially since I'm moving closer to movie characterization for him. (Mostly cuz I don't care much about him. The people I like I tend to take the best parts of both movie and book characterization, I find. =P) Maybe I'll end up just siccing Galadriel on him. Hehe. * Modified Arwen's part a bit...still not too satisfied with her non-part. Also need to figure out what I'm going to do with Eowyn. We need more strong female characters dangit. Eh... part of the problem is that I'm mainly writing from the POV of the SI characters, so we don't really get to see a lot of the stuff going on elsewhere. I should maybe write a separate interlude in tandem with the storyline covering all the NPC stuff going on. Ugh. But that's also so much work. It started with me writing out my headcanon for the backstory of the LOTR setting that I'm using for the YvtW xover. Basically starting with the movie-verse as a baseline and then start making changes, adding things, and explaining things from a different pov to align more book-verse themes/characterization/etc. to it. I still have a huge infodump file. And a genealogy graph (so I can keep my OCs straight). Then I started writing post-Hobbit:BOFA plot and dialogue. So I thought... eh, I can put fic snippets in a separate file. Now, 60+ Google doc pages later, I...pretty much have a full fledged fic. Total of 27k+ words. That's like half a nanowrimo. I... I don't even know where all these words came from. Also, my muses are demanding I write First Age Silm-fic set in Doriath, a backstory to the backstory. According to canon, Elrond & Elros got their names from when they were discovered outside/inside a waterfall. This was presumably a discovery (and naming) by the people of Gil-Galad or even the High King himself. But...before that they spent time under the care of Maedhros and Maglor (which from what accounts I've been able to find, they were treated well), and then before they had to have spent a few years with their mother in Avernien. So, are you telling me they didn't get names before then? Ok, I can maybe see them keeping mum about the names the Kinslayers gave them while living in the company of all those people who hate the Feanorians' guts. But what about their original father/mother-names? Ok, maybe they didn't have a father name because Earendil might've been at sea (and never returned in all the time since their birth until their capture)...but they had to have at least a mother name? Did Elwing, like, keep it a great secret or something? I mean, we know her cousin Celeborn was alive at least; she didn't tell him? Anyway, while on the topic of Peredhil, here's the timeline I have from near the end of the First Age. EDIT: W00T, bot a response to the first part of this post on tumblr... lots of interesting info. Huh. I always thought the long range telepathic communion betwen Elrond & Galadriel in LOTR (and then Gandalf and Galadriel in Hobbit) was something PJ made up for the movies. Well, the contents of the meetings probably were, but the mechanism at least was not. Apparently the ability itself is book canon. See Ósanwe-kenta. Also several fandom discussions. So, according to this video, you don’t actually need to have long hair to make a bowstring; clumps of shorter hair will also do just fine. My interpretation of Tolkien’s sentence is that all elf bows use elf hair as the string, and the main difference between the Galadhrim bow to Legolas’ original Mirkwood bow is that it was longer & stouter because it was presumably made from mallorn tree wood. Huh. Earendil having higher % of human in him than Elwing explains why he would’ve picked the fate of Men if his wife hadn’t chosen the fate of Elves for them both. It's been raining all morning. I feel like a zombie. Spent my stam on PAD and no GW2/STO. Might as well vomit some junk from my sleep deprived mind. So. Have LOTR movie vs book ramblings plus a few more pokes at the YvtW xover. Thranduil = 瑟兰迪尔 = 瑟爹 = "Th-dad"
Legolas = 莱格拉斯 = 小叶子 = "Little Leaf"
Tauriel = 陶瑞尔 = 桃子 = "Peaches"
Gandalf = 甘道夫 = 豆腐 = "Tofu"
Thorin = 索林 = 大舅 = "Uncle"
Also, after reading a metric ton of posts about Hobbit, I have to *facepalm* even more at the epic geography!fail and history!fail that was the new content PJ put into the Hobbit movies. So, I, uh, watched this on fast forward. Basically, skipped scenes that didn't have elves in it. I didn't have a lot of expectations going into the film since I've read all the spoilers and know what I was getting into. And yeah, no pleasant surprises. Ugh. Let's get the really obvious complaints out of the way. 1. Pacing was horrible. As bad as the last one. Smaug. Dying barely past the opening credits. W. T. F.
No further major battle scenes about 2/3rds of the way through in favor of Thorin's little corner of the field. I thought this thing was supposed to be about armies? Galadriel. WTF was she supposed to be? Weakling who couldn't bear up under the Nine? Powerful enough to zap off Sauron? Was she going dark or something with all that black-lighting? Cuz that's what the colors give off. Tauriel. Ugh. Don't shoehorn in a female OC if you don't want her to be scrutinized. She was a horrible disappointment as a female character. She brought *nothing* to the table except a horrible romance that did not belong to this story. Also, threatened regicide (and kinslaying!). WTF. Did everyone forget this is supposed to be a Tolkien elf? Only thing she got right was not to get fridged. Honestly, outside of some moments of coolness, there's not much that this movie has going for it. Thranduil. Awww, he's a good daddy; like, total and complete pushover when it comes to his son. Also, a pretty reasonable guy, and a decent king. Did those eagles airdrop in bear cavalry? Oh, I think that was supposed to be Beorn. And some of the fight scenes are nice. Too many of those builds up a tolerance unfortunately. Been plotting out the timelines of the LOTR books vs movies (hence my rant about Aragorn & co having superspeed a few posts back) in order to determine a rough timeline for the YvtW xover story. It's mainly for my own reference so I can plot the sequence of events. I've been trying to keep time references in the story itself to a minimum so that I don't lock myself into anything specific. In the book, the Battle of Morannon ended in late March. Then Aragorn was crowned on the first day of May, and married sometime in June-July. The symbolism is of course it was a new spring for Men, and the newly planted White Tree would be in bloom. But, no matter how I fudge things, the end of the War of the Ring in our crossover comes out somewhere in early to mid August. I really don't want to have everyone hang around all the way til spring (Feb at the earliest) for end that segment of plot. But I guess I will if I have to. How necessary is the symbolism of spring to Aragorn's coronation anyway? Probably the likes of Elrond and Denethor would be more picky about things like that than he is. Would they be amenable to a coronation along the lines of harvest festival? Autumnal equinox, maybe? And a wedding for Samhain (Halloween)? I dropped all the extra dragons and stuff from the original version, because honestly, they're not needed. I think I've kept things more in line with canon and still made for an effective narrative. Plans for part 6...I want to incorporate more of Mirkwood and possibly Dale/Erebor - which means that part won't get written until I see Hobbit 3 and decide what to keep/discard. I did have one scene already with Thranduil, and that is also still subject to retcon. As for the segue into the Afterlife arc, it doesn't make sense anymore for Aragorn to bring up the connection. If ossian approves, I want to use character from the Simarillion. I have two potential candidates, so let me know who you prefer. * Tuor - He's similar to the PCs in that he wasn't born immortal, which gives a mechanism to introduce some background meta stuff. Canonically known to have dropped off the map, so to speak, for a long time. His Edain heritage may give him the freedom to 'travel beyond the circle of the world' which sounds like an euphemism for d-travel. 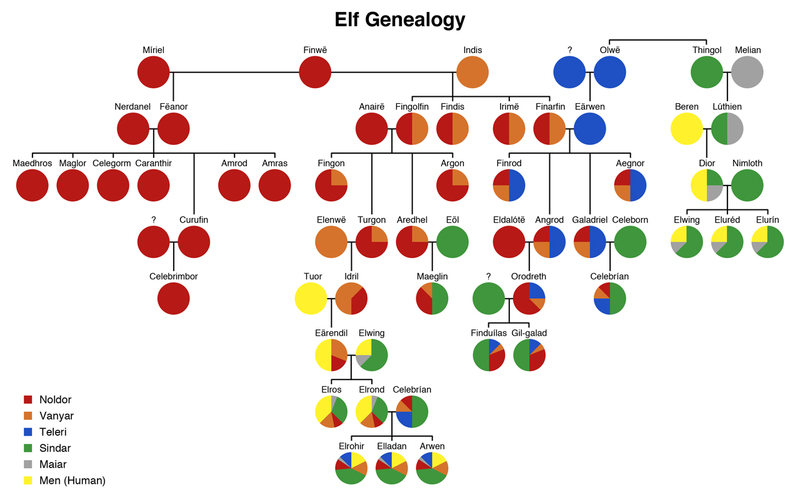 Also, he would bring together 4 generations of direct lineage (Tuor - Earendil - Elrond - Elladan/Elrohir) which could make for some interesting family drama. * Maglor - Another wanderer whose fate is unknown since the end of the First Age. He would introduce lots of potential conflict/drama. Given that as long as the Andromeda is around, Earendil's Simaril is technically within reach, a lot of people (including the PCs) would get all paranoid about the Doom with Maglor around. Elrond would likely have some mixed feelings about the guy due to being kidnapped/raised by him. And even putting aside the Silmaril, I suspect Earendil would not like him for the same reason. - Going with a saner Paths of the Dead thing (see last entry). Which means we only get quickly where we are going due to explicit cheating rather than via the magic of scene change. Also, ditching the CGI ghosts at Pelargir because it would be a little too anti-climatic to bring them to Minas Tirith, since I don't plan on having more than just the one big battle there. - Just realized while researching while rewriting: Shelob is a Bug/Poison type by pokemon standards. Bug/Poison are vulnerable to Fire/Psychic types. CBY, who killed Shelob, used Fire (lightsaber) and Psychic (Dark Side Force) attacks. Wow, it all works out! - Feeling really sorry for Faramir after everything I've done (and will do further) to him. By the same respects, if I need Denethor alive, it'll be so I can torture him. Narratively speaking, that is. My PC doesn't do torture. - According to wiki, Theodred is like 10+ years older than Eomer/Eowyn. However, his movie actor looks really young. So I am retconning my continuity based on the movie actor and making him the same age as Eowyn, and thus younger than Eomer. I found this site for all my LOTR mapping needs! More thoughts after re-watching ROTK. 1. Movie!Aragorn/Legolas/Gimli have superspeed. Yes they do. See, in the book it took the Grey Company 5 days to ride from the Paths to the Dead to Pelargir, and that was on horeback riding in haste. They were sporadically fighting from Linhir onwards, and they reached that on day 3. In the movie, the three of them lost their horses before Erech, and then managed to reach the banks of the Anduin in 2 days (Elrond tells Aragorn at Dunharrow the Corsairs will be at Minas Tirith in 2 days, so.) Now, I'm guessing they skipped Linhir and Pelargir (so those places burned?) which skims off 2 days. Also, they had no food & water with them during this run. But then, neither did they seem to when chasing after the uruk hai in the beginning of TTT. Numenoreans in movie!ME don't need wussy things like water or food, man. - Massive, massive rewrite from the original. Basically everything in Rohan was rewritten. Most of my PC's scenes were also reshuffled and altered. It started with Hobbit II, and me trawling tumblr for pics. That led to reading linked articles about Tolkien in general, which somehow led me to go back and re-read the YvtW story arc for LOTR. And well, I ended up starting the re-write of that shebang that I'd always wanted to do but could never work up the motivation. Those were the easy parts. When we did the original thread, only FOTR had come out, so TTT and ROTK were entirely based on the book (entire sections were lifted almost verbatim) and not the movies. So the later parts will pretty much need to be completely re-written to incorporate more movie canon. So I saw The Hobbit (Part 2) lately, and found I do have some stuff to say about it. My mom's company sponsored a free lunch and showing of The Hobbit today and I was able to see it. (My company also sponsored a showing last Friday at the opening day, but it was at 8 AM and I just couldn't make myself get up that early.) So here are my thoughts about this part one of the prequel trilogy to LOTR. Overall, I would say it's a good popcorn movie, I guess. Some good eyecandy spread through it, and not just of people, though there are some bits of good characterization... But. Well. It tries way too hard to live up to LOTR and doesn't make it by far. In fact, I would say that the worst flaws of this movie is that it's been bogged down with the success of the previous films. Tl;dr. - Middle Earth is still an awesome place to see on the big screen. But a good portion of the movie should still belong in the extended edition. Gandalf is still awesome, but I'm not feeling the love for the Fellowship Company here, if I even remember half their names.